The Best Shark Dive in the World! : Cristina - Shark Love? The romantic in me says it's LURVE. The cynic says the shark is assuming that position to have ectoparasites removed - and simply following what it takes to be the ecto-parasite-removing creature when it retreats. I think this shows how we, as hug-loving mammals, are hard-wired to misinterpret what is presumably going on - and hence how easily the idiots (Ritter, Treadwell et al) can go off the transcendental deep end. Clearly, those are conditioned Sharks that as a minimum have been habituated to humans insofar as they appear to have lost their natural fear of them. 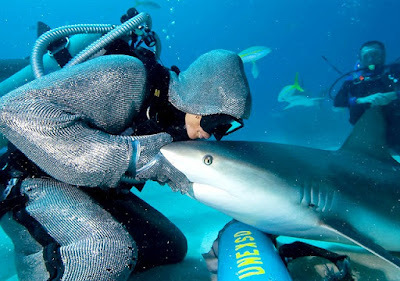 This is one of the known side-effects of provisioned Shark dives that when they are conducted responsibly, leads to less agonism = defensive aggression - the flip side being that the resulting familiarity can lead to the well-known problems with those infamous beggar Sharks, hence the need for good protocols. So yes those Sharks may well want to get cleaned. Jimmy did show me equally amazing footage of Lemons snuggling up to divers at the Tiger Beach cleaning station, and equally only being rewarded with a friendly rub. Both Jimmy and Cristina have removed squillions of hooks, and the Sharks may indeed regard, and thus seek them out as some sort of cleaner organism as a consequence. But maybe it's something else? Specially in the case of Cristina that induces a trance-like state (not tonic!) by stimulating the Sharks' snout, the Sharks may simply come in for the resulting, obviously pleasurable sensation. Does that equal LURVE and affection and the like? Methinks not, it may be more akin to us, ahem, visiting a brothel - but it is totally amazing nevertheless! Does this mean that we should all swarm out and start giving Sharks affection, or whatever, by conditioning them to come in and get petted? Is it not enough to "witness" these animals in all their grace and elegance? Do we need to touch them and ride them as well? Do photographers really need to shoot inside a Tigers mouth? Do we need to throw pokey-sticks at them? Where does it end, where do we call the game and set the safety goal posts? And for me, the answer is crystal clear. 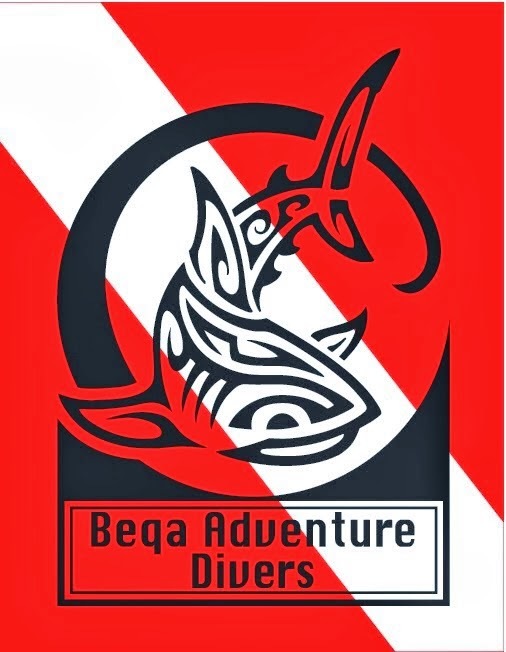 Like I never cease to repeat, Shark dives need to be regarded as wildlife encounters and subsequently, conditioning needs to be kept at an absolute minimum = limited to attracting otherwise shy species, and ensuring the necessary degree of safety. All else is just simply unwarranted and often disrespectful showmanship that benefits only the human, with only more risks for the animal. Cristina and Jimmy of course get a pass. Mind you, this not because of what they do but because of who they are! The other molesters, not so much - but once you've logged thousands of Shark dives, devoted your life to Shark conservation but above all, removed hundreds of hooks, you too will be entitled to some rather superfluous, and clearly not reciprocated Shark LURVE - petting, scratching, hugging and kissing included! In diesem Sinne - happy Shark diving! "Does that equal LURVE and affection and the like? Methinks not, it may be more akin to us, ahem, visiting a brothel - but it is totally amazing nevertheless!" - I hope your sharks don't read your blog and see their reputations being trashed. Judging by the expression on the shark's face in the upper photo I'd add that it doesn't appear to like being kissed at all. Like most folks going to a brothel - q.e.d.! I admit losing this argument utterly. I bow to your expertise.